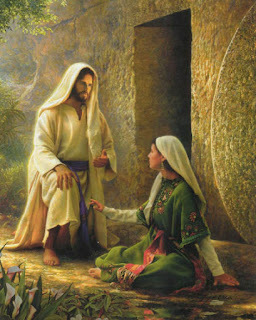 The gospel reading of Easter Tuesday is one of the most emotional and powerful instance in the Gospel where Mary Magdalene encounters the risen Lord at the tomb. Her response and perception of the whole incident is highly emotional. She sees the angels but is not in any sense surprised or amazed - as if they were creatures one encounters day in and day out in the market place! Her whole concern and worry at that point is the missing body! Nothing matters more to her than the one whose body she came to anoint. Contrast that highly emotional perspective with that of the rational dimension of Peter's ministry with the Jews in the same post-resurrection scenario. The Jews listen to the 'arguments' of Peter, and are 'convinced' of what he says and get baptised. Perhaps the only difference one sees and is in a way important is that the 'rational' means adds numbers, is meant for the crowd; while the emotional is highly personal and intimate. One needs both along ones' journey of faith and growth. I think this is my favorite resurrection story followed by the Emmaus one. If one experienced something, there would be no need for the arguments I guess. Certainly not in this particular relationship. It's because I've given so much importance to the intellectual understanding of things versus their visceral experience, that any experience that bypasses my brain makes me wonder if it really happened. It takes some amount of tolerance (i don't know what word to use) to allow the experience to exist on its own.